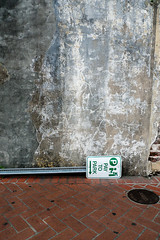 This was taken a few blocks from Bourbon Street in New Orleans, while I was there for a conference. I always try to book a few extra hours at the beginning and/or end of a business trip to do some photography in the area. The interest in this photo, to me, is pretty obvious. Sign that is supposed to be vertical. Detailed, multi-colored but flat cement wall. Brick ground. Interesting contrast of this and that plus the sign that is out of place and out of order. The whole area around Bourbon street is pretty interesting. The street itself is surreal. It truly is a bunch of drunken, partying, crazy people just wandering around being…drunk, partying, etc. I guess it’s like being around Vegas today mixed in with Times Square before it was cleaned up. But as one walks away from Bourbon street, the houses and buildings start to go back and forth between nice and run down or even shuttered. Things get run down and a lot less touristy very fast. This is much more true as one heads away from the river.